Should Nate Silver be worried? No. 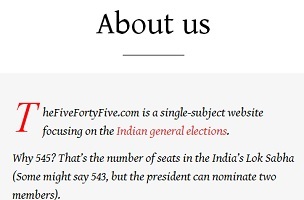 The students behind the day-old website – Devjyot Ghoshal, Anand Katakam, Iva Dixit, Indrani Basu, Rishi Iyengar and Aparna Alluri – chose the number 545 because that is the number of seats that makes up India’s Lok Sabha. The site hit 500 likes on Facebook in just about 36 hours and has over 400 followers on site Twitter. Very cool. We’ll keep an eye on this new project and applaud the group for their promise that the site will stay away from “high-brow and jargon-led reportage.” The next general election in India is scheduled to take place in multiple phases starting April 16 and ending May 13.